Fabric Mart Fabricistas: Made by a Fabricista: Marfy 6194 dresses in black and red linen! 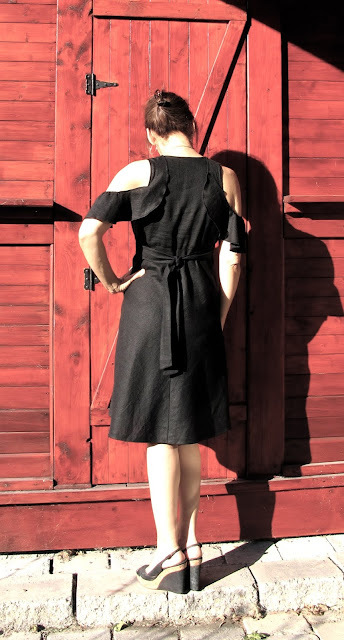 Made by a Fabricista: Marfy 6194 dresses in black and red linen! Does it sometimes happen to you that you're inexplicably drawn to a particular pattern? Well, that's just what happened to me when I looked at the Marfy summer collection on Vogue's website. Marfy 6194 is the one dress pattern I kept looking at repeatedly, so I took the plunge and ordered it! 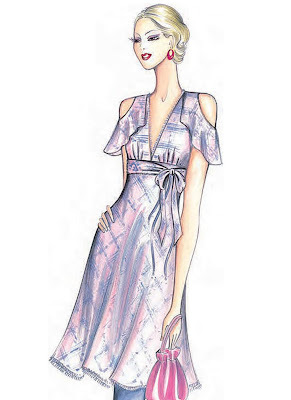 That dress just seemed so summery to me: it features a V neckline bodice with underbust gathers, an empire waistline (skirt is cut on the bias), shoulder flounces and ties you can tie in the front or in the back. And linen just seemed a perfect choice for it! 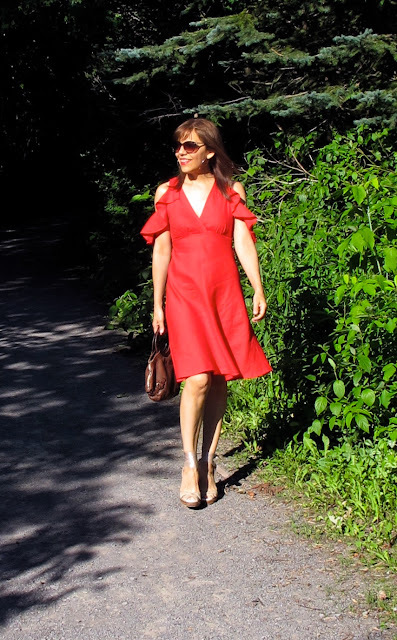 OK, I just adore linen; I've been wanting to try FM's designer linen for a looonng time - especially after seeing other Fabricistas makes in that fabric - so for my July post I treated myself with that gorgeous fabric and made this dress in black, but also in red! The quality of this linen is superb and it comes in many colours - right now black and red appear to be sold out but they will eventually come back in stock, and I hope FM never ceases to carry that fabric as it's very popular among customers and it's a joy to work with. The weight is just right for so many kind of garments - dresses, skirts, boxy tops, pants, etc. - and I think with lighter colours you can even get away without a lining. Well my red dress certainly didn't needed one, it's opaque enough that underwear doesn't show through. Working with a Marfy pattern is always special for me, their designs are unique, they have the most beautiful dresses and the italian cut is genius. Their patterns come cut pre-cut by hand with no seam allowances, there are no instructions and no technical drawing. Each piece has notches and letters (A, B, C, etc.) which indicates what goes with what and the order of construction. The grainline is drawn (by hand) on each pattern piece, as well as important indications (fold, zipper, etc.) in 4 languages. What you receive by mail is a neatly folded bunch of pattern pieces with the Marfy sticker indicating the pattern number; don't ditch the enveloppe as it's the only enveloppe you get to store the pattern! With dress pattern Marfy 6194 all I had to rely on visually was the illustration above. Most of the patterns on Vogue's website feature a back view, but not this one! There is a mistake in the pattern illustration: the drawing shows a V neckline where the two bodice pieces don't overlap, but the pattern pieces clearly indicate that the bodice pieces are meant to criss cross one over another. Also, the pattern pieces for the ties say 'cut 1' when in reality you have to cut 2 of each piece. I made a size 42, which is the one that corresponded to my measurements; Marfy patterns have a limited size range, usually just 3 or 4 sizes are offered. A quick muslin revealed a close fit for the bodice, which is like the pattern illustration suggests. The only modification I had to do fitwise was to add 1/4'' at the underbust seam. I don't have a low bust, but the distance between shoulder and underbust is really short! That small modification was just perfect for me. The pattern calls for a zipper at the left side, but I realized when I tried my muslin on that I could just pull the dress over my head without a side opening. Putting a zipper in a bias skirt is not something I run after, so if I can get away without it I'm just happy! The illustration suggests ties tied in a bow at the front; I tried it like that but it felt too girly. Instead of using the long and the short tie pieces I used the shorter one and made two ties of similar length that I tied in the back. The skirt of that dress is cut on the bias. A bias cut has more drape, is more 'swingy' and it will gently hug your silhouette. The back skirt piece has a marking saying 'cut on the bias fold', but I thought I would have a better chance to have the skirt hang evenly with a CB seam (since the front has a CF seam). When you sew a garment on the bias, you must not forget to let it hang for at least 24 hours (48 hours is even better) prior to hem. With the red dress the CF and CB seams dipped a lot and I had to even the hem, while with the black one it's just the CB seam that dipped. 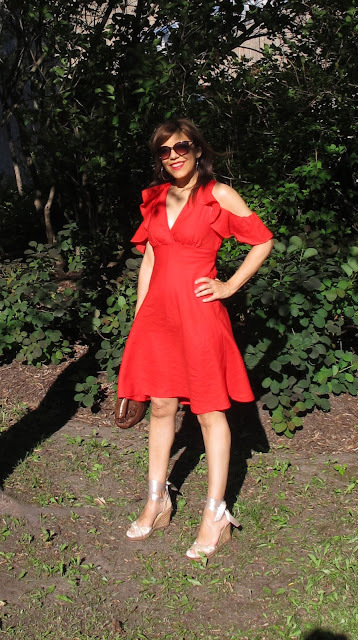 You could finish the shoulder flounces in many ways: with a narrow rolled hem, you could sew them double layer if your fabric has a wrong side, or make a narrow rolled hem on the serger like I did. It's not easy though as most of the flounce piece is rounded and is on the full bias. I suggest that you plan enough fabric to have a test piece to practice (I totally scrapped it on my first try). Here is a close up where you can see the rolled hem on the flounce, as well as the purchased cotton/poly single fold bias tape I used to finish the neckline and the armholes on both dresses. This method worked really well as the cotton/poly bias has just the right weight to work with linen and it stabilizes the front opening without adding bulk or having to deal with facings. I usually stretch it (the tape) slightly where the armhole is the most rounded to prevent the fabric from stretching or distorting in that area. All the edges are topstiched with a 1 cm seam. 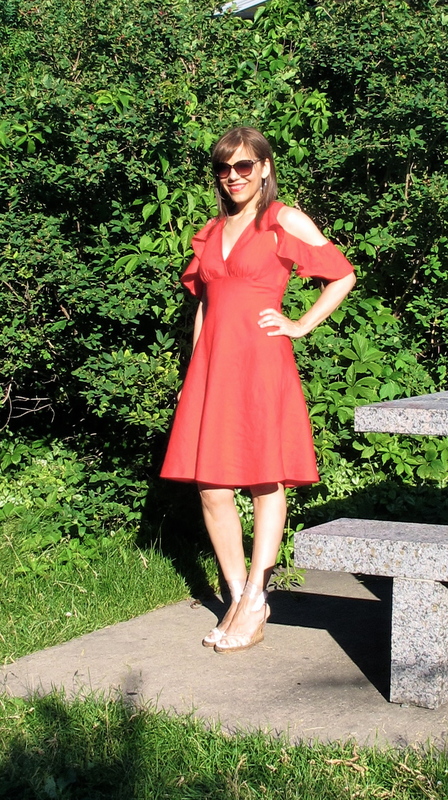 Marfy 6194 is a superbly drafted dress pattern and I'm very happy to have two new linen dresses in my wardrobe! A dress like that with a bias cut in such a quality linen would certainly have cost me big bucks in RTW! FM always have a nice selection of linen aside from the designer section; there are a lot of options there, and I'm very tempted by some of them for a future version. That pattern is also very versatile: the flounces also look good worn under the arm (you could sew them all around the armhole), the ties can be tied in the front or in the back, and the dress is also super cute without the flounces. I've already worn both of them a couple of times, so that's a sign of a successful project! Bye for now, and see you again in August! Til then, wishing you lots of happy sewing! Both are gorgeous!! I made a top for my mom from the designer linen and was quite impressed by it. I don't normally sew/wear linen! Thank you so much! I must say I'm impressed too with the designer linen. Seems to be the perfect weight for a dress and you don't have to line. Thank you Kathleen! Come on and make those Marfys! ;-) It's probably easier than what you expect, and practice with a muslin first, you'll be less intimidated! Fantastic dresses! So flattering, and they look super comfortable to wear. I love that pattern- will have to go check out Marfy now! Thank you Ann! It's a great pattern, you should make it. The dress is easy to assemble and it's a relatively quick make - the flounce takes a bit long but that's all. I'm not sure how I missed this when it was posted but I happy I saw it today. Both of these dresses are gorgeous and I know they feel amazing because I love Fabric Marts designer linen. Amazing work!